The bedrock of freedom? Denying the government the power of censorship. NADINE STROSSEN: Censorship has always been used by those in power to stifle the voices of those who are criticizing them and seeking to bring about some kind of law reform. So it's not surprising that any authoritarian regime today and throughout history has always stifled protesting voices, has always exercised censorship, including over the arts and culture as well as politics. So, Nazi Germany, fascist Italy, to the Soviet Union and Turkey and a whole range of authoritarian countries—Saudi Arabia springs to mind—have all exercised censorship as a way of maintaining the power of those who hold it and of preventing reform and spreading of human rights and also thwarting the pursuit of truth in realms of science and other fields of human endeavor. I think the flipside to the question of "What is so dangerous about censorship?" is "What is so positive about free speech?" Because we lose the positive potential of free speech through censorship, and freedom of speech is, as great Supreme Court justices in the United States have recognized, the essence of individual liberty. Freedom of thought cannot really be exercised unless you have freedom of speech, so it's a way of forming your ideas, forming your own identity, communicating with other people to forge bonds of friendship, bonds of community. Freedom of speech is used to join together with others to amplify our messages so that we can have more of an impact in bringing about whatever changes or reforms we'd like to see happen in society. Freedom of speech is essential for petitioning the government, lobbying, trying to persuade those we elect and hold accountable to us to adopt certain policies or reject certain policies. Freedom of speech is also essential for the pursuit of truth. As somebody once said: Every great truth began as a blasphemy, so if government had the power to censor, as it has in the past, it has thwarted advances in all kinds of scientific and social scientific fields. Art censorship has been used to stifle expression that has been important, not only for the individual artist herself or himself, but also for those who are deprived, then, of the opportunity to enjoy and be inspired and enlightened by creativity. I definitely agree with the Supreme Court when it said that freedom of speech really is the bedrock of every other right, and really almost everything positive in our society could not be achieved without that essential bedrock. There is absolutely no doubt that speech can do an infinite amount of harm, as well as an infinite amount of good. The reason why censorship is bad is precisely because speech is so powerful. And with that power we human beings can exert it either to great good or to great ill. Now the question is what does more harm, trusting our fellow citizens on the whole to minimize the adverse impact, adverse potential impact of speech, or trusting government to pick and choose which potentially dangerous, harmful speech should be censored? 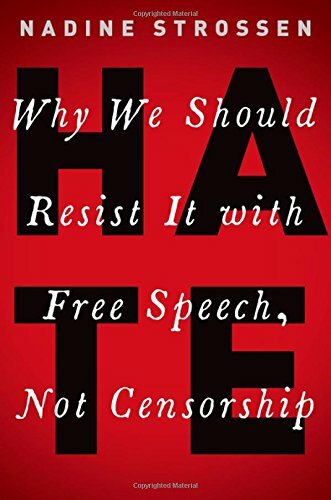 What we've seen throughout history and around the world, not surprisingly, is whoever exercises censorship power does it in a way to perpetuate their own power and to disproportionately silence the voice of their critics. So today we have a president who attacks fake news—a lot of my liberal friends, and I am a bleeding-heart liberal as well as a civil libertarian, a lot of my liberal friends will say: But there is such danger coming from right-wing media and the dark corners of the Internet—"Shouldn't we censor that version of fake news?" And I say, "Who exercises the lever of power today? Are we going to give to the Trump administration the power to decide which news is sufficiently 'fake', sufficiently 'dangerous', sufficiently 'harmful' that their FCC licenses should be revoked?" I think it would not be FOX News whose license would be revoked or whose voices would be suppressed, it would be CNN and so forth. And mark my words I would be equally distraught at having voices on the right silenced for a whole lot of reasons, one of which is the indivisibility of all rights. So if we're licensing the government or empowering the government to say, "This is sufficiently misleading that "it's going to be suppressed," it would just be a matter of time before there's a change in administration, a change in ideology, and it would be voices on the other end of the political spectrum that are suppressed. And then also for the reason that censorship does more harm than good in general, which is that there is some really important benefit to confront ideas that are out there that people hold. I want to know that they have those ideas; I don't want them to hide in the dark corners of the Internet and to go underground. I want to be able to respond to them, perhaps dissuade people from holding those ideas, certainly persuade other people not to adhere to those ideas. If it's a hateful or discriminatory idea, I want to monitor the people who have those ideas to make sure that they don't actually engage in discriminatory or violent conduct. So there are all kinds of benefits from listening, even I would say especially, to ideas that we consider to be dangerous and odious. The United States Supreme Court made an observation, which I think is really important, that freedom of speech in terms of government policies, public policies, is especially important because it is not only a matter of individual liberty and self-expression, but it is essential for our system of self-government. The way the Supreme Court put it was more or less this: That freedom of speech about policy issues is the essence of self-government. The message to the team is keep the eyes on the prize. We have to look beyond the particular factual situation and understand that we are fighting for something larger, which encompasses the ideas that are antithetical to the ones that happened to be at issue in a particular case. So people will often say to me, as somebody who is Jewish and the daughter of a Holocaust survivor who barely survived the Buchenwald Concentration Camp: How can I of all people defend the Nazis? And I always say I'm not defending the Nazis, I'm defending freedom of speech as an inviolable, indivisible principal that is only going to remain strong if we continue to respect that bedrock viewpoint neutrality principal denying government the power to suppress an idea merely because in one community that idea is deemed to be unpopular or hateful or hated. Because I know that in many communities in this country, ideas that I cherish as a civil libertarian, as a human rights champion, those ideas are seen as dangerous and are subject to censorship. So I'm not defending the Nazis, I'm defending a principle that is especially important for those of us who want to have the freedom to raise our voices to protest the Nazis and everything they stand for.